Last week the current affairs blog Broadsheet.ie posted a number of ‘Rapid Questions’ by Dublin City Councillor Cian O’Callaghan in connection with the contentious development of ‘modular’ / timber framed homes in Ballymun. BRegs Blog contributors replied ‘rapidly’ with detailed answers to the eight questions tabled and these were published the next day by Broadsheet.ie. Link here: Thanks to Broadsheet.ie for permission to publish them again below. In a post yesterday Social Democrat Fingal County Councillor Cian O’Callaghan asked a series of questions about modular housing. Further to this, building and construction forum BRegs Blog have compiled fact-laden responses to Mr O’Callaghan’s questions [below]. 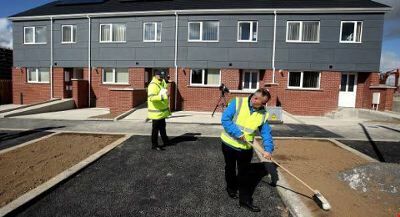 Meanwhile, during a report on RTÉ’s Six One news last night journalist Mark Coughlan reported that the modular homes could end up costing €243,000 per unit, more than twice the €100,000 figure originally earmarked..
Cllr Cian O’Callaghan: How much faster will these homes be delivered than conventional housing? Time was saved in the design stage by side-stepping planning laws (there was no public consultation), side-stepping procurement rules and side-stepping building control laws by starting on site before it was legal. There will be costs and delay for all of this in any future phases. O’Callaghan: What was the final cost of the rapid build homes at Ballymun and what is the full breakdown of these costs? BRegs: According to Dublin City Council (DCC) the final account has not been agreed yet. It is unclear who will be liable for costs of the programme overrun of at least four months. This could be very expensive if DCC made changes to the contract after it was awarded. The original contract figure, agreed by DCC and the Department of the Environment, of €5,340,775.00 for the 22 houses equates to a cost of €242,762.50 per house. This figures excludes any site purchase cost, planning application costs, development levies, or developer’s profits. 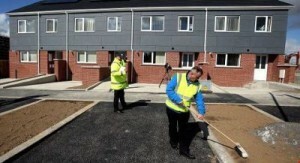 Comparable, index construction costs are €100,000 – €140,000 for this type of social housing. Although we are not aware of site costs in Ballymun, 29 ‘rapid’ units are planned for a site in Drimnagh which was purchased by DCC for €3.5m. This suggests a per unit site cost of €120,000, and eventual total cost including site of over €360,000 per temporary unit. O’Callaghan: “At what point was the idea of lower cost modular homes replaced with rapid build housing? Why? What is the rationale for the construction of hybrid modular/ wet build housing? BRegs: Only Dublin City Council (Housing and Residential Services) can answer this question. It appears that only one tender was received for the ‘modular housing’ from Western Building Systems Ltd. who were awarded the contract . The bar for who was allowed to tender was set very high at a €10m turnover. The tender also demanded a four-week construction programme in bad weather which was seen by many to be totally unachievable. This may have been the deciding factor if the tender proposed ‘rapid-build’ although there is nothing rapid about the housing at Poppintree in Ballymun. O’Callaghan: What is the guarantee on these homes? What is their expected life span? Is it any different to conventional housing? BRegs: The tender documentation specified a 60-year life span. The Certificate of Compliance and Completion from the Assigned Certifier is thought by some to be a guarantee. DCC Tender documents require the builder to sign-off on all statutory regulations. This is of concern as it suggests no independent oversight or inspections of the quality and safety of the units provided. DCC could sue the contractor and/or the Assigned Certifier if there is a defect, if they are still around and they can prove a case. O’Callaghan: Will a cost effectiveness analysis be undertaken to compare rapid build housing with other methods of housing delivery? BRegs: There should be but there probably will not. Proper modular housing is more expensive than traditional housing but its inherent advantage is in being able to supply housing rapidly to meet short-term emergencies and being reusable at other locations. There could be economies of scale if they set up the contracts to maximise value and spent adequate time designing the units and prioritising quality and value for money. Government departments are reluctant to provide details of PPP’s and public tenders, even though all tenderers are party to this information. A reluctance to provide accurate cost information puts all other future tenderers at a competitive disadvantage, and makes public scrutiny of ‘value for money’ impossible. O’Callaghan: What is the estimated cost per unit when larger economies of scale and competitive tendering is introduced to the process? BRegs: There is no guarantee that there will be any economies of scale. In fact there is a risk that parceling together big contracts will reduce competitiveness and maintain high costs because only a few large bidders will be able to take part (similar to the vulture funds purchasing the large NAMA portfolios). The successful contractor will then be able to squeeze lower prices on the sub-contractors because he will control the market. This risks reducing quality while increasing the margin for the contractor. It is unlikely that the cost of ‘rapid’ housing will reduce by 50% to resemble average costs of more traditional forms of construction, even if built at significant volumes. O’Callaghan: What capacity level within the sector in Ireland is needed to reach an optimum level of delivery in terms of cost effectiveness? Is the goal to reach this optimum level of delivery and if so when? BRegs: There is plenty of capacity in the smaller domestic builders and trades, if they can compete. Standard models of procurement on smaller sites can yield significant economies due to increased competitiveness. The high threshold of turnover specified in the next four projects, between €7m and €12m, precludes participation by a large proportion of willing and able small to medium sized contractors. BRegs: The quality control and safety checks in the Ballymun housing is controlled by the contractor, because that is the way that DCC has set it up. The houses will be inspected and certified privately by people engaged by the builder. The rapid build school that had fire safety problems was built by the same company that is providing the rapid houses in Ballymun. Our current system of ‘reinforced self-certification’ is just that – self-certification by contractors of their own work with no independent oversight. Recent experience of defective ‘rapid’ build schools suggests that in the event of a defect later on the state, remarkably, will bear the costs of repairs. This entry was posted in Building Regulations on April 20, 2016 by BRegs Admin.